1. Does the cap violate the Illinois Constitution’s prohibition on “special legislation,” Art. IV, § 3, because it unnecessarily, arbitrarily, and irrationally grants exceptional benefits and privileges exclusively to certain classes of tort defendants. 2. 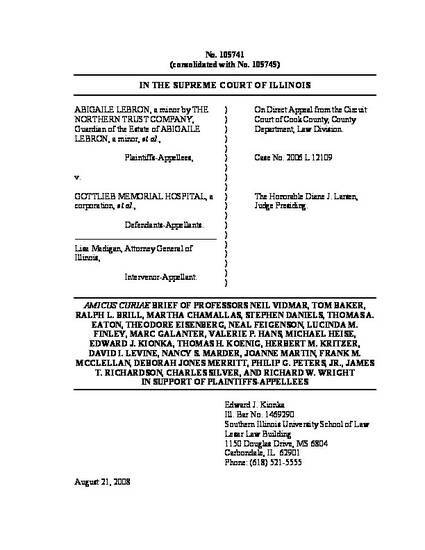 Does the cap violate the Illinois Constitution’s guarantee of “equal protection,” Art. I, § 2, because it unnecessarily, arbitrarily, and irrationally imposes extraordinary burdens uniquely upon certain classes and sub-classes of tort plaintiffs.